The rubber stamp has two faces, one serious and one full of fun. Practical use has been made of the rubber stamp for many years to apply official information to a range of products. On the lighter side, rubber stamps distinguished from their serious brothers as art stamps bear every kind of art work from outlines of Monet's gardens to silly sayings. Rubber stamps are enjoying a renaissance. They are popular among serious hobbyists, collectors, and want-to-be artists who can't necessarily draw. Rubber stamps are particularly attractive for makers of memory books, scrapbooks, photo albums, and souvenir books of weddings and births because the stamps can be chosen to establish a theme. One or several stamps can be used with a selection of ink colors, special papers, and techniques such as application of embossing powder to slow-drying ink, to communicate the theme with variety and creativity. Primitive stamps that existed long before rubber stamps were made are still produced by hand in other countries. Mud is used in India to make molds that are used directly as stamps. The mud images are painted with colored juice from fruit, flowers, bark, and other plant matter to create a colored image that can be stamped on fabric, paper, and products. Animal hide has also been used by some cultures. Detailed impressions can be cut in thick pieces of hide that are longlasting and resilient, like rubber. There were two essential prerequisites for the origin of the rubber stamp. Rubber was discovered in the Amazon River Basin in 1736 by the French explorer Charles Marie de la Condamine. Cubes were made of the substance and used for rubbing out lead pencil marks, but the material was unstable—when the temperature rose, the cubes turned to jelly. This difficulty was solved in 1839 by Charles Goodyear. Some years before, Goodyear had begun pondering this problem with rubber, and he was determined to solve it. By accident, he spilled a mixture of gum rubber and sulfur on a hot stove. The combination of sulfur as an accelerator and heat cured the rubber. Goodyear named his process vulcanization after the Roman god of fire. Vulcanized rubber was adaptable to thousands of uses, as Goodyear recognized when he patented his process in 1844. Marking devices similar to rubber stamps but made of other materials were available in the early 1800s. By 1860, mechanical hand stamps made of metal were in common use. The actual inventor of the rubber stamp is a subject of controversy. L.F. Witherell of Knoxville, Illinois, claimed to have invented the rubber stamp in 1866 by having fixed rubber letters on the end of a bedpost for the purpose of marking the wooden pumps he manufactured with identifications. Unfortunately, Witherell never produced the landmark bedpost or other proof. James Orton Woodruff of New York borrowed the vulcanizer used by his uncle, a dentist. Rubber was used in dentistry to mold denture bases, and the small vulcanizers dentists operated were ideal for batch production of rubber stamps. Walnut mounts for Woodruffs stamps and items that have been printed with his stamps remain; the rubber stamps themselves were destroyed by ink that contained solvents. There are other claimants to the inventor of the rubber stamp, but Woodruff and Witherell have left the best stories, if not convincing evidence. By 1866, rubber stamp businesses were flourishing, and L.F.W. Dorman commercialized the process by manufacturing vulcanizers specifically for stamp makers. By 1892, there were 4,000 rubber stamp manufacturers and dealers in the United States. Rubber stamp manufacturers do not produce the elements that make a rubber stamp directly from raw materials. Raw materials include latex rubber, wood for the mounting blocks, adhesive-backed padding that is placed between the rubber and the block, and adhesive-backed labels. All of these items are produced by specialty manufacturers who supply them to rubber stamp makers. Designs for rubber art stamps originate at the hands of a variety of artists. Large-scale manufacturers of rubber stamps use original art and hire freelance artists to produce unique designs that are copyrighted by the artist and manufacturer. Some makers use existing artwork produced by name artists whose artwork—in rubber stamp form—is then uniquely available from one manufacturer. Some rubber stamp companies will also produce custom designs from artwork provided by the customer, and, of course, manufacturers of rubber stamps for items such as return addresses produce stamps from data supplied by the customer. Usually, this information is provided to fit a template or a specified word or letter limit so that multiple stamps can be produced at once, despite the unique contents. Almost any kind of artwork can be produced in rubber stamp form. Another rubber stamp revolution has been developed by manufacturing large blocks with families of words (like names of flowers) or greetings (such as "Happy Birthday" repeated in a variety of lettering styles); these blocks are used by stampers to make greeting cards, wrapping paper, and other personal products with a theme or message. By giving classes and showing hobbyists clever ways of using these products, manufacturers fuel demands for their creations. 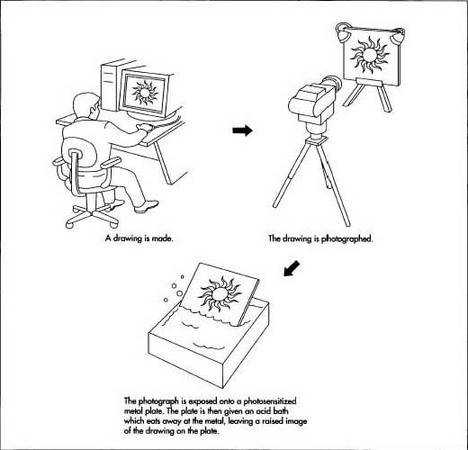 After a rubber stamp design is selected for manufacture, a drawing of the design is photographed, and multiple copies of the image are transferred to an aluminum plate. The plate is then bathed in acid that eats away the exposed metal so the design is etched or raised above the plate. 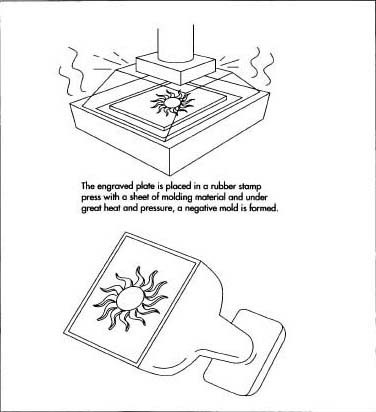 The engraved plate (a positive image) is placed on a sheet of Bakelite, a registered brand of resins and plastics that can be used to produce finely detailed molds, in the rubber stamp press or vulcanizer. Under heat and pressure in the vulcanizer, the engraved plate leaves a negative mold in the resin sheet. A sheet of rubber is then laid over the Bakelite mold, and both are heated in a vulcanizer to produce the final positive image in rubber. Vulcanizing is a process in which crude or synthetic rubber is treated with heat and pressure to alter its properties of strength and chemical stability. Vulcanizers were developed as part of the rubber tire industry but are now used in many applications to treat rubber, fibers, polymers, and other materials. Operators of vulcanizers have their own techniques for producing the finest products, and the time and pressure used to vulcanize a sheet of rubber depends on the size of the mold and the operator's experience. Typically, a sheet of rubber stamps is subjected to 900 lb (408.6 kg) per square inch of pressure for about 3 minutes to complete vulcanization. The Bakelite molds are also vulcanized under about the same conditions. The mold or rubber sheet is then removed and set aside to cool. then handled just like a sheet of rubber in the following steps to complete a stamp. Most of the other steps involved in producing rubber stamps require skilled hand labor. The sheets of formed rubber are pressed onto sheets of adhering material with adhesive on both sides. The mounted rubber sheets are cut into individual stamps by workers using scissors. They must cut the stamp so that the design is not damaged but also so that enough excess material is trimmed away to limit the likelihood that they will pick up ink and spread unwanted impressions. Some designs are cut on a clicker press, which is a die press that cuts predetermined shapes by applying pressure to dies with razor-sharp edges. aging of the wood or by changes in temperature and humidity. The blocks of wood are hand-rubbed with linseed oil, which helps protect the wood. The designs are mounted by hand, and exceptional care is required to mount the designs squarely. A clear piece of adhesive plastic is placed on the top of the maple block. The stamp design is imprinted on this label, which is called an index. The manufacturer Hero Arts developed a color index to show the design of the rubber stamp and suggest ways in which it can be colored to best convey the design. These labels are also made by outside suppliers. Other steps in the manufacturing process are needed for some specialized commercial stamps. Date stamps and similar stamps with a variety of phrases are made of strips of rubber with the numbers or phrases impressed in them. The rubber-band-like strips are seamless and are placed on metal mounts that can be rotated with a dial or a key on the side of the collection of stamps. Thin sheet metal is used to manufacture the housing for the stamps and the dials or key. A wood handle is attached to the metal mount on the opposite side of the device from the printing image of the stamp. Plastic mounts are used for some commercial stamps with a single stamp for highly repetitive use or with the self-inking kind of commercial stamps that allow room for the stamp to reverse itself in the case and rest against an enclosed ink source. Finished rubber stamps are sorted and stored by type. As orders are received from retailers, the stamps are selected individually for packing and shipping. In some cases, sets of stamps are made and prepacked for sale only as sets. Because so much of the rubber stamp-making process is done by hand, quality control is built into the process. Each laborer sees the work of the previous handler, so substandard stamps can be removed anywhere in the process. Quality is also ensured by using only the finest materials. Manufacturers use 100% Goodyear rubber and maple blocks that are often superior to furniture quality maple. Adhesives used for the adhering material and the indexes are chosen for long life and ability to withstand reasonable ranges of temperature and humidity. The process of making rubber stamps produces very little waste. Designs are laid out on the rubber sheets to minimize waste. Although the trimmings from the rubber and adhering material have to be disposed, they amount to a small volume. If a design is discontinued, rubber stamps on hand are not thrown away. Instead, manufacturers donate them to hospitals and charitable organizations where they can be used. The future of rubber stamps is both practical and fun. Stamps used by businesses will be required in many kinds of applications until a paperless society is truly achieved. Other practical applications like signature and return address stamps are also not likely to be replaced by computer applications in the near future. As for art stamps and the rubber stamp hobby, this interest appears to be thriving as stampers seek to create individual cards, letters, communications, and keepsakes that convey their personalities and talents. Kaprow, Allan. Assemblages, Environment & Happenings. New York: Harry N. Abrams, Inc., 1966. Miller, Joni K. and Lowry Thompson. The Rubber Stamp Album. New York: Workman Publishing, 1978. Rivard, Karen and Thomas H. Brinkmann. The Marking Story. Chicago, IL: Marking Device Association, 1968. Sloane, T. O'Connor. Rubber Hand Stamps and the Manipulation of Rubber. New York: Norman W. Henley & Co., 1891. Rubberstamp madness. Corvallis, Oregon (a bimonthly publication for hobbyists). Hero Arts Rubber Stamps, Inc. http://www.heroarts.com .